AMD has officially taken the wraps off its next-generation graphics architecture named Vega at CES 2017. 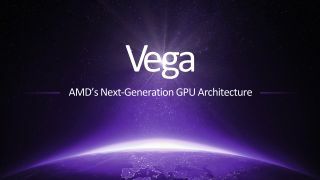 Vega offers a next-generation compute engine, and boasts a new programmable geometry pipeline which offers twice the peak output per clock. AMD notes that the R9 Fury X offers four geometry engines and a peak of four polygons per clock. Comparatively, Vega offers the same number of engines, but they can handle up to 11 polygons per clock – a boost of 2.6x – which is a lot more pixel shifting power, and an impressive leap in performance to say the least. The new architecture boasts high-bandwidth cache and HBM2 video memory that offers twice the bandwidth per pin compared to HBM, and no less than eight times the capacity per stack. Compared to GDDR5 video RAM, AMD claims HBM2 overall footprint is 50% smaller. AMD also notes that the high-bandwidth cache controller offers ‘adaptive, fine-grained movement’, and the new cards will benefit from 512TB of virtual address space. Vega also benefits from a next-gen Pixel engine and other clever bits of tech to help eke out extra performance while keeping a lid on power consumption, such as a draw stream binning rasterizer. This sort of extra graphics muscle will not just be great for games – and demanding VR titles – but also more heavyweight applications. Graphics cards are increasingly being used for, such as data crunching, machine learning, and of course modelling and rendering too. At the big Las Vegas show, AMD also took the time to reveal FreeSync 2, the sequel to its adaptive sync technology that helps tackle stuttering and tearing to allow for smoother gaming (and rivals Nvidia’s G-Sync). FreeSync 2 monitors won’t replace FreeSync, but will run alongside existing models, with the sequel adding one big juicy extra – support for HDR. The displays will use high-brightness pixels and a wide color gamut, plus what’s crucial is there will also be support for ‘low frame-rate compensation’. As AMD notes, current HDR formats are designed with movies in mind, so tone mapping is handled by the display itself, which can add a nasty amount of latency when it comes to playing games. FreeSync 2, however, boasts a new API which means a lower latency for HDR, transferring the ‘transport’ work from the display to the GPU, and allowing the game to deliver the tone mapping directly to the monitor. In other words, no more horrible lag. Any FreeSync compatible Radeon graphics card will support this sequel technology (including the Polaris-based RX boards), and we can expect the first FreeSync 2 monitors to emerge in the first half of this year.